Commercial excavation is beneficial for enterprises that intend on removing land to lay the groundwork for a construction project that will replace the excavated land area. 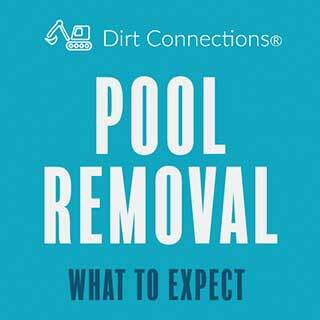 The commercial excavation process is a precise and detailed process that requires large amounts of fill dirt. In order for an excavation project to be successful, there is a clear timeline that must be followed. These steps include clearing away the land area that will be excavated, rough staking the land, preparing equipment, grading the land, and ensuring that the excavation area passes an inspection. Additionally, commercial excavation contractors ensure that the resulting land is not prone to excessive erosion. This blog will outline the entire process to prepare you for what to expect in your next commercial excavation project. 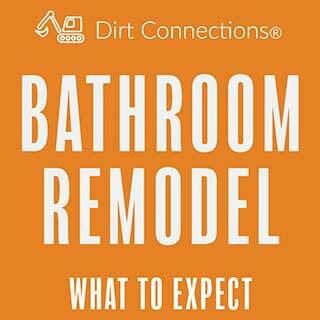 The first step in any excavation project is clearing the land of bushes, rocks, plants, weeds, etc. The removal of trees should not be taken lightly, as they need to be removed by completely to include their root systems. Leaving behind roots can lead to serious shifting problems down the road. The next step is to lay down the excavation lines and centre lines. These will show where things are going to go including the outline of the building, roads, and driveways. This step should not be rushed through the placement, size, and depth of everything should be carefully measured to make sure it fits the projects intended goal. This is when last minute changes can be made on the location of the building on the lot because once digging begins it will be increasingly harder to make even minor adjustments. Not only does the stylistic placement of the building need to be considered, but more importantly detailed measurements need to be taken so that the excavator is able to ensure a level foundation and determine factors such as sewer and water-line placement. These stakes will also help to determine if further tree removal is needed, or if the land needs to be altered to prevent flooding. Next, the equipment has to be dealt with. Excavation requires a lot of big equipment. How the equipment is going to get on the lot, move around, and be stored needs to be carefully considered to lower safety hazards. All of the equipment should be looked over to make sure that it can be used safely and that it will be able to perform its necessary job. 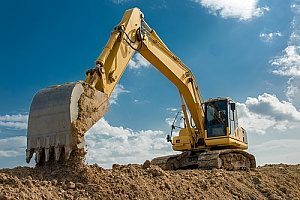 Fill dirt is a necessary part of land grading, so how the dirt can get to the proper location and how it can be stored need to be considered. Fill dirt will be delivered by dump trucks, so accounting for their arrival and movement of the land is necessary. Dump trucks are used to transport loose materials such as dirt, sand or gravel. A typical dump truck has an open-box bed, which is hinged at the rear and attached to a hydraulic ram in the front. This allows for the bed to raise up and dump the loose materials on the ground behind it. Dump trucks are measured by how many cubic yards they can hold. A standard dump truck would most likely be used, and they can typically carry 10 to 12 cubic yards of dirt in a truckload. How much fill dirt the project needs will determine how many dump trucks will be required. If 32 cubic yards of dirt is needed, three dump trucks can be expected. Estimating how many dump trucks are showing up on delivery day is very important in making sure they can reach the intended drop off location. 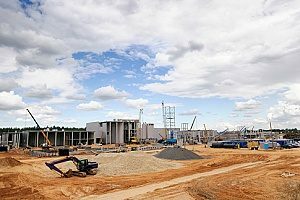 A commercial project is going to have a lot of dirt, and it won’t be easy to move, so ideally it will be placed as close to where it will be used as possible. Land grading takes place next. It is the actual process of reshaping the dirt and making a level or slope base so that it can be built on top of. The land must be completely dry and solid for proper grading, which means that generally, at least three days must pass without rain. The ideal time for land grading is going to occur in the summer months once the heavy rainfall of spring has passed. Because the land grading has to be done while the ground isn’t frozen, there is only a small window of months where it can be completed before temperatures begin to drop in the fall. Grading for a house usually takes about 1-2 days in ideal weather, and grading for a commercial project like a small condo or strip mall can take 3-5 days. Fill dirt is used for land grading because its composition doesn’t contain any organic matter which would decompose over time and cause the dirt to shift. Fill dirt is used to fill in any low points in the land to ensure that the land is level. In some cases, the land will be graded will fill dirt so that it rises in certain areas. This could be for practical purposes or to create a more hilly terrain. This part of the excavation process must be inspected before moving forward. There are several reasons why a rough grade may fail inspection. Typically these are insufficient rainwater leaders, improper window well depth, or adjacent construction. Finally, excavation begins. Excavation is the process of removing soil or rock to create a trench. The appropriate amount of soil will be removed to a depth that will ensure a secure foundation. The soil will also be tested for stability during this step. If the commercial project is taking place in an area that experiences a lot of rain, the excavator might make trench drains underground to divert the water away from high-risk erosion areas. 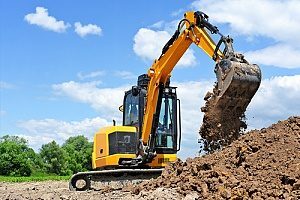 Commercial excavation is a large component of all construction projects. It starts by removing anything from the land such as brush, trees, and rocks. The actual excavation is moving the dirt from one place to another. While it may sound simple, it’s a very meticulous job because soil depth is a fundamental part of supporting a solid foundation. Compaction equipment and compaction tests will have to be done to ensure that the firmness of the dirt is adequate to support what it needs to. Most likely a commercial excavation is going to have a have a civil engineer to oversee this portion of the project. They have valuable knowledge about the principles of mechanics, construction of civil works, and the forces of nature. The goal should be to impact the natural environment as much as possible as working with the environment will result in a much stronger foundation than working against it. Erosion and sediment control need to be strongly taken into consideration as they can lead to very serious problems in the future if they are neglected. 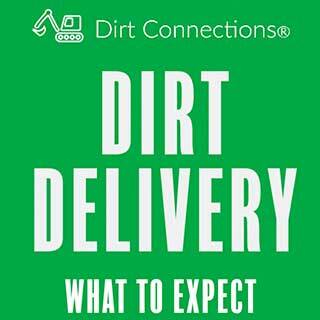 Fill dirt plays a very important part in a commercial excavation, so reach out to a Virginia fill dirt contractor for more information and to schedule your fill dirt delivery.